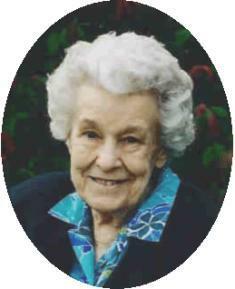 Mildred B. K auth, 95, formerly of North Milwaukee Street, Port Washington died Friday, November 18, 2005 at Heritage Nursing and Rehabilitation Center, Port Washington. She was born on October 30, 1910 in Slinger; daughter of Otto and Margret Kippenhan Bartelt. She was valedictorian of her High School class and later was employed with the West Bend Company. On February 3, 1934 she married Charles P. Kauth, MD, also of Slinger, in West Bend. In 1937 they moved to Port Washington where her husband joined AH Barr, MD in practice. While raising a family she was her husband’s bookkeeper and was active in the community. She was a former Cub Scout leader and member of the former St. Alphonsus Hospital Auxiliary. She enjoyed the company of the St. Mary’s Parish Christian Women and a 44 year member of Van Ells-Schanen American Legion Post 82 Auxiliary. Her husband preceded her in death on July 12, 1989. She was an avid reader and crossword puzzle solver. A 48 year survivor of breast cancer she was an advocate for women’s health. She played the violin and enjoyed playing duets on the piano with her husband. Most of all she was a mother and homemaker who cherished family and times spent at Forest Lake in Wisconsin. She is survived by her daughter Amy (Ken) Bigjohn RN of West Salem, WI; four sons, James (Elizabeth) Kauth MD of Bellevue, WA; Thomas (Cornelia) Kauth of Campbellsport, WI and Destin, FL, Laurence (JoAnn) Kauth MD of Milwaukee and Charles P.(Linda) Kauth, Jr. DDS of Manitowoc. She is further survived by 18 grandchildren, 12 great-grandchildren, other relatives and friends. A Memorial Funeral Service will take place at 6PM Tuesday, Nov. 22 at the Poole Funeral Home, 203 N. Wisconsin St., Port Washington. Interment will be in St. Mary’s Cemetery, Port Washington. Family will receive friends 4-6 PM Tuesday. Memorials to the Susan G. Komen Breast Cancer Foundation or Breast Cancer Charity of Choice appreciated. Special thanks to Dr. Jensen and the staff at Heritage Nursing and Rehabilitation Center.